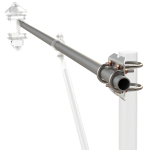 The CM202 is a crossarm that attaches to an instrumentation tower or tripod. It provides a rugged, weather-resistant sensor mount for one sensor. The CM202 is compatible with all of our tripods, towers, and CM200-series brackets. It can also be attached to a user-supplied pole. The CM202 provides a rugged, weather-resistant sensor mount for one sensor (typically). 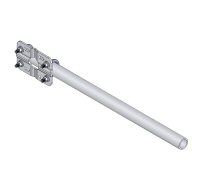 It consists of a 2-ft aluminum pipe and the CM210 mounting bracket kit. U-bolts included with the mounting bracket are used to attach the crossarm to a tripod mast, tower leg, or user-supplied vertical pipe (1.0” to 2.1” OD). All of our tripods and towers are compatible with the CM202. A U-bolt mounting scheme allows the crossarm to be secured to the tripod or tower at the optimal measurement height for the sensor. The sensor is then mounted to the other end of the crossarm using a variety of mounts—depending on the sensor being deployed. The options available for mounting the sensor to the crossarm are listed as accessories under the Ordering information. The CM202 can also be attached to a user-supplied pole (1.0 in. to 2.1 in. OD). Can the CMB200 Crossarm Brace Kit be used with the CM202 crossarm? Technically, the medium bracket (pn 31592) of the CMB200 Crossarm Brace Kit can be used with the CM202 crossarm, but Campbell Scientific does not recommend this usage.